This movie came out in 2002. Back then, it may have seemed possible that a good number of people weren’t familiar with accessible diets like allergies, gluten-free, vegetarian, or vegan for example. But today, in 2015 – special dietary requirements feel pretty mainstream. In my research role at work, I’m often surprised by how little certain market segments know about food. For example, in one study we asked respondents about their carbohydrate preferences and some people thought dairy or fruit were their best sources of carb. This is even when they were given choices like rice, potatoes, pasta and bread. So, I really shouldn’t have been surprised when I was sat near a woman at a reception who announced that she was, “veganish”. When I first heard that phrase, I thought, “What in the world is Veganish? Perhaps she will let it go if something is cooked in butter when she is out at a restaurant.” But no, that wasn’t it. This woman was affronted not to have been offered a vegetarian option BUT in a later course, enjoyed eating a portion of chicken! Apparently, she also likes fish. I had to hold back my laugh. If the music hadn’t have been so loud over dinner I would have asked her more. Eating fish and chicken isn’t even vegetarian and certainly isn’t vegan! It was so like the Big Fat Greek wedding – but it’s 2015! So, to those of you who need a quick run down, here is one simple definition. ie. no fish or chicken! Our family eats meat or fish a few times a week but certainly not everyday. 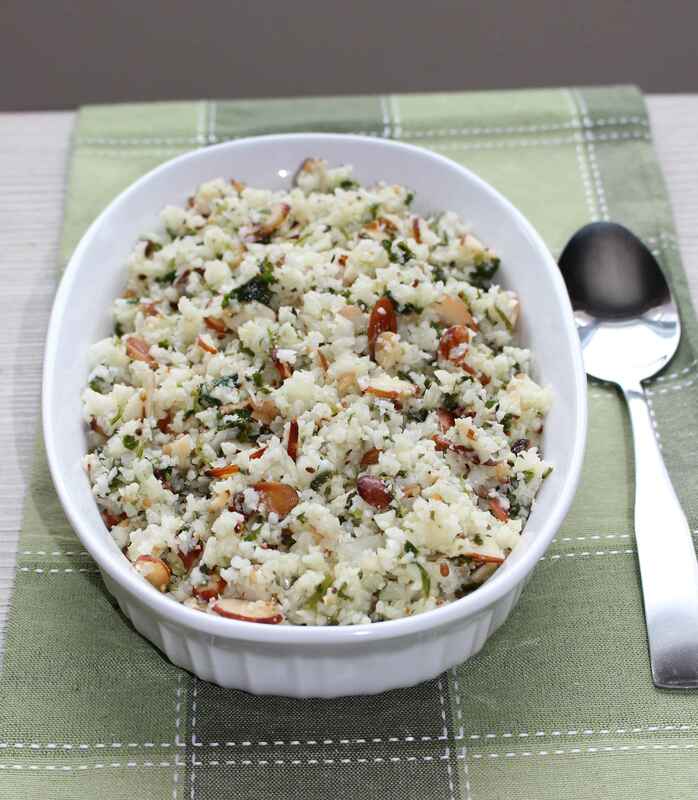 To this, I recently tried a new Meatless Monday recipe (on a Thursday) – Cauliflower Rice. I liked it. My better half who hates cauliflower didn’t mind it, and the four children hated it, which was a surprise as they will eat everything in this recipe! Mothers, you just never know, right? Using a food processor or sharp knife, finely chop the parsley and mix with a squeeze of fresh lemon juice and the oil. This makes a lovely side on it’s own and I actually used the leftovers from this with my cauliflower recipe the next day! Use salt and pepper to suit your taste. Dry fry the almonds and hemp hearts over medium heat in a clean frying pan until slightly browned. Set aside. Using your food processor, blitz the washed cauliflower florets until they resemble rice. In a pot of boiling water, place cauliflower in a fine mesh sieve and drop into the boiling water for approx. 3-5 min. Lift the sieve out of the water and using the back of a large spoon, push the water out of the cauliflower while holding the sieve over the pot (so the water drips back into it). Transfer the warm cauliflower into a side dish that can be covered (i.e tip the sieve over and into the other dish). Rest your oven mitts and a tea town on top of the covered dish to keep the cauliflower warm. Keep cooking the cauliflower rice in batches until it is all done, keeping it warm as you go. I did this because it is February and freezing out but it also tastes good cold the next day! When all of the cauliflower is cooked, stir in the prepared parsley, almonds, hemp hearts and honey. Serve hot if it’s winter and you want something warm. Alternatively, serve cold as a salad! P.S. My Big Fat Greek Wedding 2 is due to come out in 2015! This recipe was inspired by the Tasting Table but I didn’t fancy the extra ice bath steps, and I knew my family wouldn’t like the olives, so came up with this combination instead.